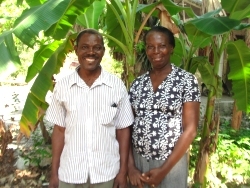 The small SHIFT Pilot Layers Poultry Project will benefit the staff and children within the Les Cayes Arc en Ciel orphanage as well as for the administrator Lucner and his wife (seen here) who own the land were the project will be housed. The small SHIFT Pilot Layers Poultry Project will be connected to the Aquaponics project that will also be based here. Three 800 gal tanks of Talapia fish to assist with our feeding program. Each tank will support 1,600 Talapia fish. 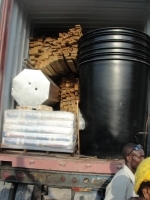 Water tanks seen here in the container. UCT is working with the Living Room on a joint venture to be established at the Montrouis Life Connection base. 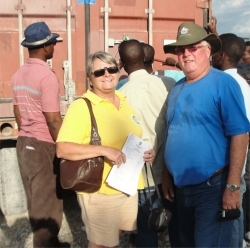 Seen here Phil Edwards from the Living Room and Jenny Tryhane founder of UCT stood in front of one of the containers. This will eventually benefit the school and the orphanages at Montrouse, and the children at the UCT base in the Yolanda Thervil Foundation in Bon Repos and Maranatha Orphanage in St Marc. It will also benefit individual youth through acquisition of skills in animal husbandry and farming, Managerial, Marketing, Sales and Accounting skills. It will act as a demonstration project for the youth in the Les Cayes district where UCT hopes to start a PowerPlay Chid Care Pilot Project in the near future including a Poultry Project. The organic manure will also fuel the BioGas production plants that will be housed close to the project as well as service the fish farm Aquaponics. The Moringa tree has great use medicinally both as preventative and treatment. 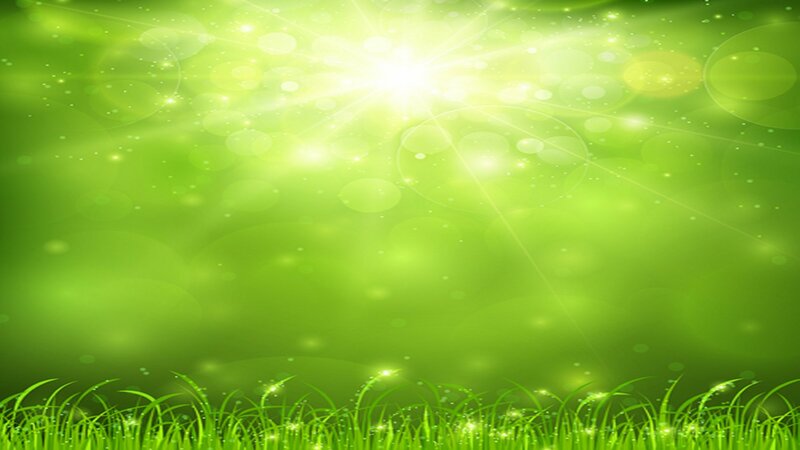 The Moringa or Miracle tree prevents 300 diseases. One area in which there has been significant scientific research is the reported antibiotic activity of this tree. The leaves contain all essential amino acids and are rich in protein, vitamin A, vitamin B, vitamin C and minerals. CLICK on the video link to view a You Tube video on Moringa 'The Miracle Tree' in Ghana and the budget for a Moringa Processing Plant. Feeding the high protein leaves to cattle and chichenns has been shown to increase weight gain by up to 32% and milk production in cattle by 43 to 65%. It also lowers the cholesterol level in eggs. The seeds contain 30 to 40% oil that is high in oleic acid, while degreased meal is 61% protein. The defatted meal is a flocculant and can be used in water purification to settle out sediments and undesirable organisms. The Moringa or 'miracle tree' is being cultivated in poverty-stricken nations, such as Niger, as a primary source of food and nutrients and UCT is committed to introduce this tree as part of our Agro forestry Program. The tree is also a rich source of antioxidants. The effects of Moringa stenopetala leaf meal (MSLM) on nutrient intake and weight of chickens has been researched. Dry matter and crude protein intake and average weight gain of chickens fed on MSLM diets increased with increasing levels of MSLM. Thus, the supplementation of chicks’ diet with MSLM could be an alternative feeding strategy in rural chicken production practices in Moringa growing tropical regions. Due to the harsh, dry climate of some parts of Haiti Moringa is a perfect choice as an alternative food supply to our Poultry Farm. Guinea corn a grass species cultivated for its edible grain. 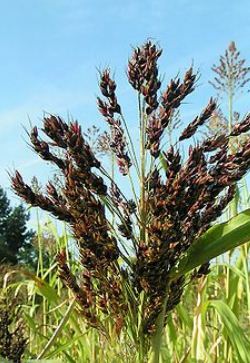 The species can grow in arid soils and withstand prolonged droughts .Guinea corn is one of a number of grains used as wheat substitutes in gluten-free recipes and products and is an excellent food for the poultry and piggery project. Cassava is a highly productive tropical crop that is traditionally cultivated to produce roots for human consumption or industrial extraction of starch. The leaves are a by-product from this operation and can be sun-dried prior to using them as a source of protein and vitamins in pig and poultry diets. 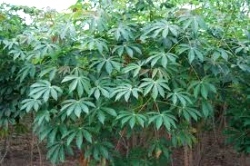 Cassava can also be cultivated in a combined forage / root system with two or more harvests of the foliage prior to letting the roots develop to maturity. More recently, efforts have been concentrated on managing it as a perennial forage crop with repeated harvesting at 2 to 3 month. In this system, the roots are not harvested, but serve as a nutrient reserve to support the forage re-growth. UCT Haiti is committed to helping in every way with reforesting Haiti and a great way is to introduce tree planting into our Poultry projects. 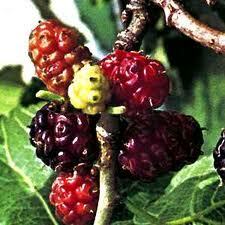 Mulberries are regarded as a health tonic and the Chinese uses the leave for tea and the berries as syrup. Known to protect many known diseases, and used as a traditional medicine, mulberry fruits are now becoming very popular outside of China. A Mulberry tree can supplement chicken food for three solid months (from July through September.) Mulberry leaf meal appears to be a very promising alternative protein source for chickens in the tropics. The high levels of nurtriants intake and digestibility confirm the high nutritive value of mulberry eaves and their potential as a forage that can support rabbit production. With comparable DM intake, digestibility and weight gain as in all-concentrate ration achieved with up to 50% substitution of concentrate in rations, rapid growth rate of rabbits can be achieved at less cost. Where marketing opportunities does not necessitate rapid weight gains, producers may chose to substitute more concentrate or even feed mulberry leaves as a sole diet to achieve satisfactory gains at even lower costs. Trichantera gigantean is a fodder tree, also known as Nacedero . It can be planted at low density at 6,700 cuttings per hectare. It grows well easily between plantation crops and produces 40-60 tons per hectare. Partial replacement of mixed feeds with Trichantera gigantea give almost the same results in terms of weight gain, and egg production and income with those chickens given sole mixed feeds. 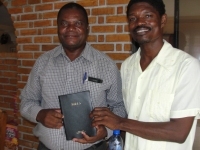 There is an increasing demand for poultry meat and eggs throughout Haiti. Of the 31 million eggs the population eats monthly, 30 million are imported from the Dominican Republic next door. Poultry farms are some of the most promising enterprises in Haiti this is because they require little space and relatively small initial capital per unit head compared to other livestock enterprises.